Let me preface this recipe by saying this one takes some time but it's so so worth it. The good thing is, it's a crockpot friendly dish. You can make part of it in advance. Even the meatballs are freezer friendly! But together, the components of this dish really come together as an amazing, delicious bowl of soup. The broth is key and it does take 8-12 hours to prepare. It's essentially a broth you assemble, throw a cover on and walk away to enjoy decorating your home for the holidays or online shopping or playing Candy Crush or taking a nap or what have you. But, if you want to make use of those hours, you can make the meatballs, as those take 1-2 hours to prepare. Bonus: you can make a big batch of meatballs and freeze them for later. The rest is easy peasy since the noodles don't take more than a few minutes to prepare on the stovetop and you can use whatever you have as a garnish or topping to your soup. All in all, it's delicious and definitely worth the time and effort! To make the broth: Place the beef shank in a crockpot (5-6 quart size). Season with salt and fill the crockpot two thirds full of water. Cover and cook on high for about 2-4 hours. Skim fat from the surface of the soup, and add the oxtail, garlic and onions. Tie the anise pods, cinnamon stick, cloves, peppercorns and ginger in a cheesecloth or place in a spice bag; add to the soup. Stir in sugar, salt and fish sauce. Add more water to keep it at two thirds full if needed. Cover once again and cook on high for 4-6 hours or on low for 6-8 hours. Check for seasoning and season to taste if needed. Remove and discard the spices. Remove the meat off the bones, discarding the bones and reserving the meat aside. Strain the broth and return to the crockpot to simmer on low. Add the reserved meat back into the crockpot. Prepare the meatballs: Combine all the meatball ingredients in a large bowl and mix it well. Cover with plastic wrap and chill in the freezer for about 30 minutes to 1 hour. Remove meatballs from freezer and place 1/4 of the meatball mixture in a food processor. Process to a completely smooth but firm paste. Stop occasionally to scrape down the sides of the work bowl. Transfer the beef paste to another bowl. Repeat and process the remaining beef 1/4 of the mixture at a time to avoid overloading your food processor work bowl. Cover the processed beef mixture and chill in the freezer for another 30 minutes. Meanwhile, bring a pot of water to boil. Remove the processed beef mixture and using wet hands, form into meatballs slightly smaller than the size of a golfball. The mixture will be sticky so be sure your hands are wet when forming the meatballs. Place the meatballs into the boiling water and allow them to float and cook for about 7-10 minutes. Prepare the noodles: Bring a large pot of lightly salted water to a boil. 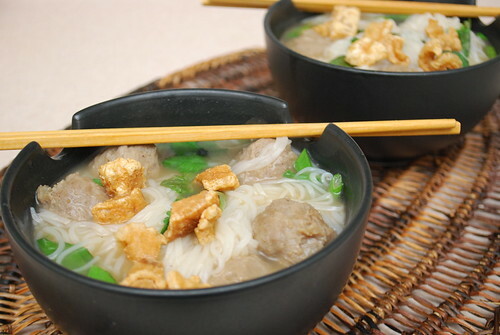 Soak the rice noodles in water for about 20 minutes, then cook in boiling water until soft, but not mushy, about 5 minutes. 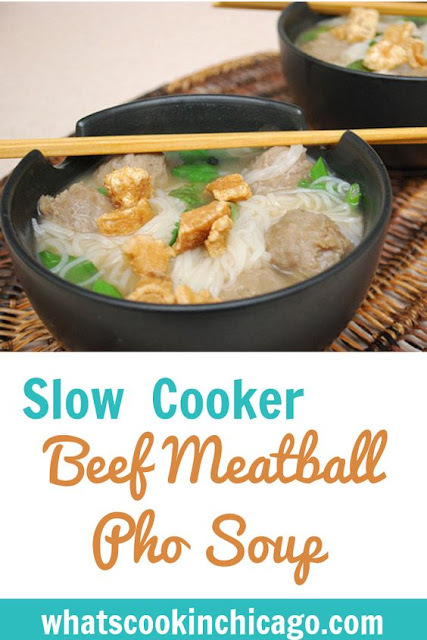 To serve: Place some noodles into a serving bowl and top with a few meatballs. Ladle hot broth over the noodles and meatballs in the bowl. Garnish with your choice of toppings. I'm not usually a fan of pho, but you make it sound so appetizing.